'Ray of Hope' is my first original solo(no overdubs) percussive guitar song and video filmed in Netherlands. Sotos’s interest in music started at age 15, when he began playing the drums. Soon after, he was having private lessons with outstanding drummer Fotis Benardo for about three years. During these years Sotos played as a drummer in various bands; with them he recorded 2 albums and played at shows in Greece, supporting artists from England and the U.S.
At 18, Sotos began his studies in Music Production & Audio Engineering at the music school IEK AKMI in Athens, Greece. Intrigued by the world of production he worked on many projects, mixing and producing music, until the age of 21 when he successfully completed his Bachelor degree with honours. Immediately after, Sotos was accepted at the Utrecht School of the Arts in the Netherlands(HKU). There he focused more on music composition, finishing his Masters Degree in Music mid 2012. 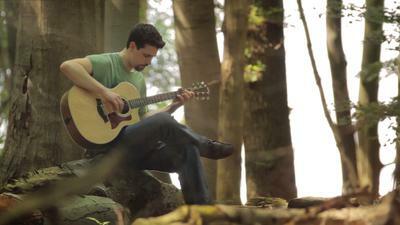 While doing his Masters Degree in early 2011, Sotos started playing the guitar. For the first year he focused on the electric guitar, but the following year found himself getting more and more interested in percussive & fingerstyle acoustic guitar. His newfound love for this style of guitar grew during his lessons with world famous acoustic guitarist Mike Dawes, which he had for about 6 months until early 2013. 24 year old Sotos was born and raised in Athens, Greece. Since 2010 he has been based in Hilversum, Netherlands, where he works from his home studio. Thankyou for sharing this super video Sotos. The composition is well contructed. Your playing style is very entertaining and the audio recording does full justice to the various techniques that you use.